region. 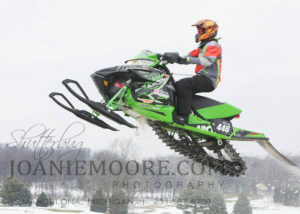 Snowmobile racing in the snow, on the grass, truck climbs at Schuss Mountain, mud bogs – all are thrilling events not only for the racers and spectators, but especially the photographer! Watch for Joanie at the Schuss Mountain Snow Challenge in April, Snowmobile drag races at several facilities in northern Michigan, including Gaylord, Mancelona and Bellaire. Check out all the racing action caught on film in our online store, JoanieMoore.zenfolio.com Images are available for puchase. We also carry many personalized products like custom posters, wall clings, frosted beer steins, flasks, mouse pads, keyrings, coffee mugs and so much more. See our list of services, then give me a shout and let’s get your order underway! Cool custom posters you can hang in the garage, office, or in your sled trailer! So many options and fun products.